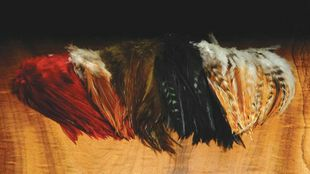 We have a super selection of Rooster Feathers, saddles, and capes, including Grizzly Saddle Hackles. 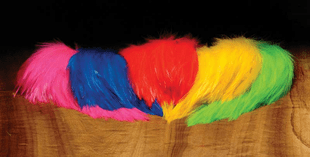 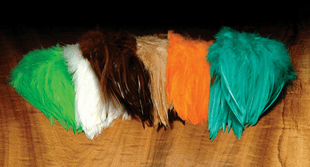 The Caddis Fly Shop has an excellent inventory of rooster feathers, and we strive to provide a broad selection of feathers and colors to serve our fly tying customers with both traditional and innovative products at low prices. 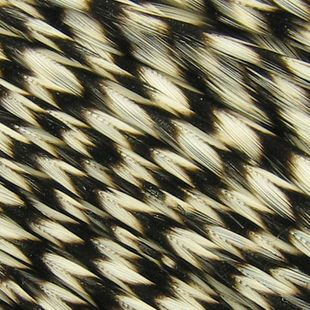 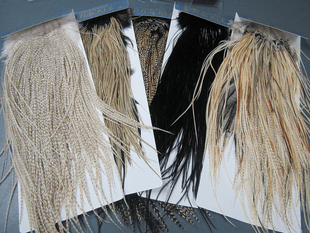 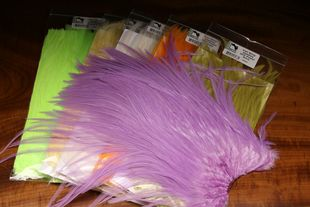 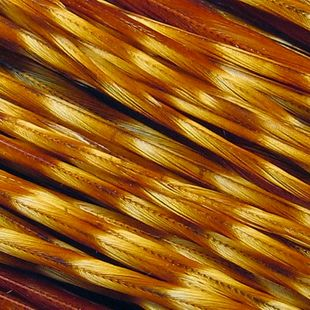 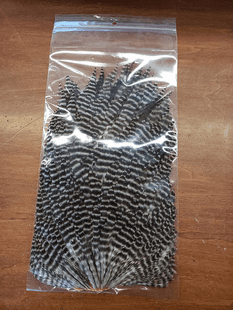 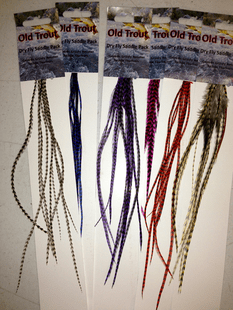 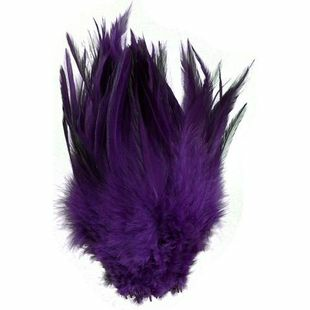 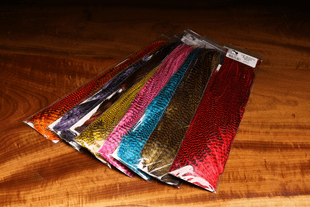 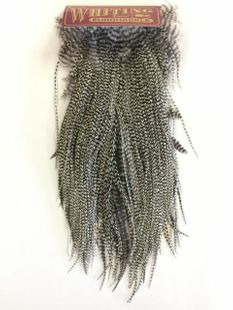 Our inventory includes Whiting Capes, and we have an excellent supply of Rooster Schlappen hackles in a wide variety of colors. 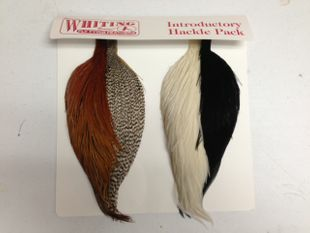 Whiting grizzly saddle hackles are available in the 100-Fly Packs. 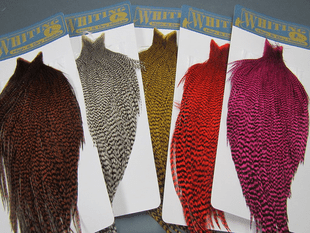 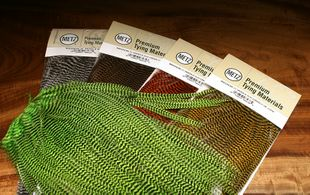 Our selection of Metz rooster capes and Whiting Farms Hebert Miner Rooster Capes is quite good; remember, we offer free shipping and no sales taxes. 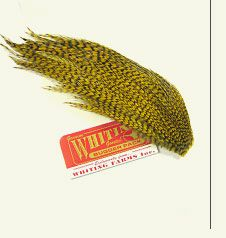 Whiting and Metz Rooster saddle and neck feathers - in stock. 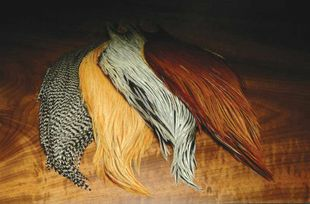 Yes, the supply of feathers has been limited recently but This has served to help us explore new sources for our fly tyers, crafters, and salons; and we believe that we are able to provide a very good selection of rooster capes, saddles, and strung feathers to tie small dry flies, large bass and saltwater flies, and to supply the needs of many feather crafters. 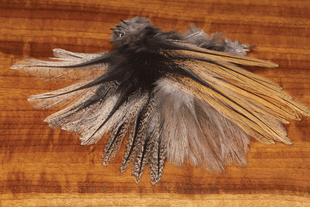 Grizzly feathers have been in short supply but we currently have these in the Whiting 100-fly packs and expect more grizzly rooster feathers to be available soon. 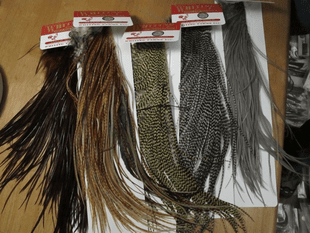 Which feathers are offered as a strung product? 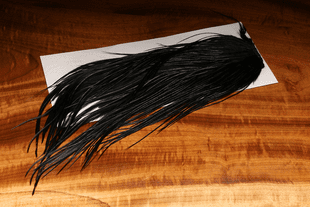 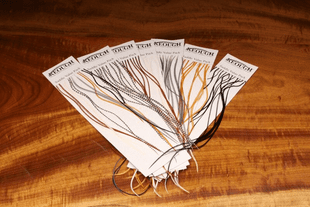 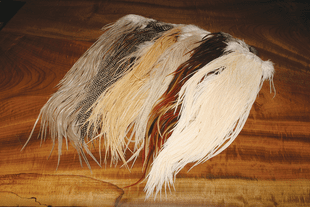 Our most consistently available feathers include the strung rooster saddle hackles, rooster schlappen hackles, and to a more limited extent, the strung grizzly variant saddle hackles. 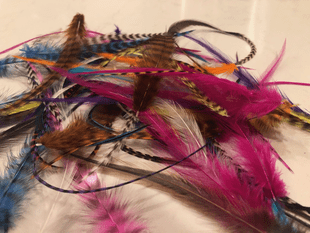 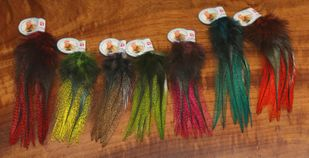 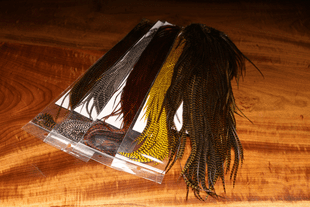 These feathers allow one to order smaller quantities and more colors and are great for both the fly tyer and crafter. 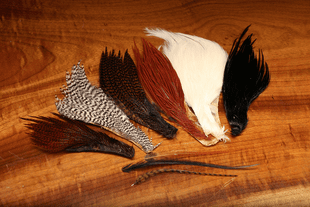 Does the Caddis Fly Shop have a Superior Feather inventory? 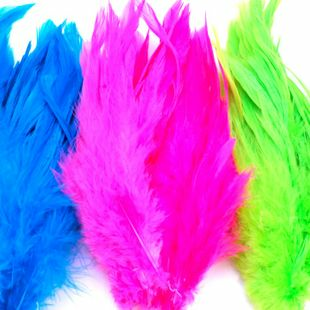 We believe that we do. 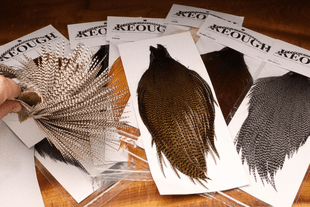 We are updating and scouring our sources on a daily basis, and this allows us to offer our long-term fly tying customers with the best feathers available anywhere, and at the best prices. 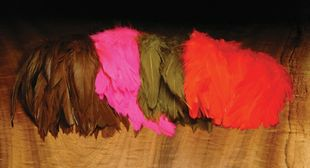 Why have feather prices and availability been so volatile during 2011? 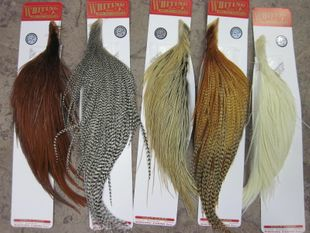 This has been the year of the Feather Hair Extension Fashion Craze. 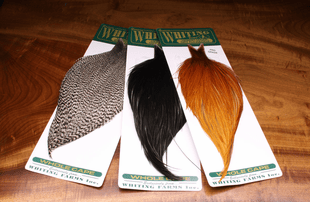 Whiting and Metz have been a traditional source of genetic rooster saddle and neck hackle feathers. 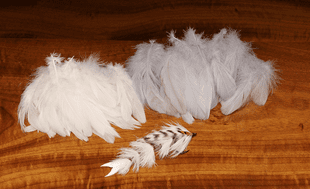 Our traditional producers and suppliers of rooster feathers were overwhelmed and their inventories depleted overnight. 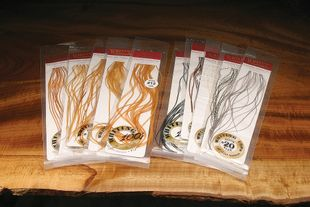 Prices soared. 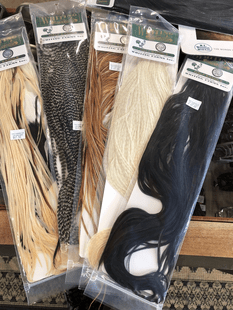 The Caddis Fly Shop has remained focused on keeping as wide a variety of rooster feathers available to supply our long time fly tyers and our new customers in the crafts world. 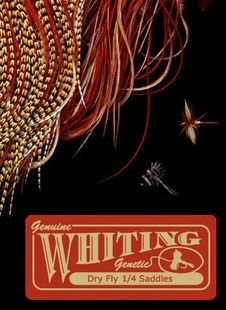 We believe that our prices are the solidly in the lowest in the industry, and that our variety is superior to any fly fishing and fly tying retailer -- period. 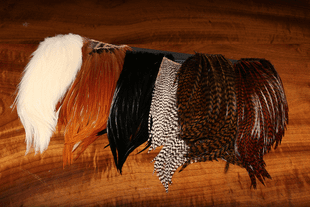 New products and replenished inventory will be added constantly We believe that more rooster saddle and neck feathers will become available shortly, so please stay tuned as we add to or refresh our product availability. 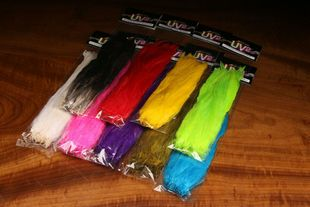 Hareline Dyed Over White Schlappen 5-7"